The price of inaction is far greater than the cost of a mistake. – Sheriff’s office employs 180 people, of whom 43 are deputies. – Tom Allman started in 1985 with the department. He became Sheriff in 2006, took office in 2007. – Annual budget is $26million. – The department has 7 canines. – They are budgeted for 7 resident deputies, and only 3 of these positions are filled. – Sheriff Allman puts 45,000 miles/year on his work vehicle. Jerry K represented us to the Board of Supervisors this week. Our Rotary Park is helping reduce drug use in that area, creates a new family-friendly place for our community. 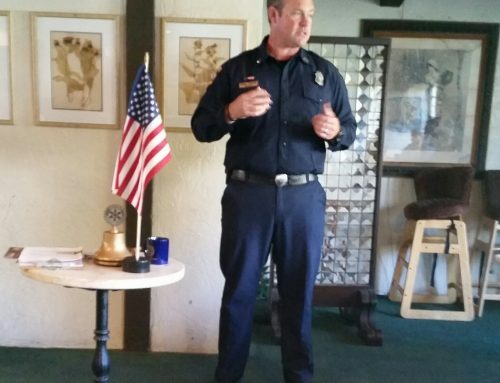 Sheriff Allman is a member of Willits Rotary. Our local community college will collaborate with the community college in Napa to replicate their training program for mental health technicians, so that we’ll have the ability to keep it staffed. Marijuana is another topic discussed at length. THC is being separated from CBDs, a component of marijuana that does not have psychotropic effects. CBDs have great medical impacts and potential. Decriminalizing marijuana has led to a decrease in land prices in the northern parts of our county. Influxes of groups from other countries, such as Bulgarians and Hmong, are increasing as these large tracts of land are cheaper. Environmental effects of larger grows are also becoming more of a problem, in particular water use. No permit, no plants. The permitting process ensures that the water and chemicals being used are within allowable limits. The State of CA has a bill in process to create a Cannabis Credit Union, so that the marijuana business can become bankable. Healthy Start in Laytonville (Jayma) has educational info about pot smoking among youth, which has greater effects on brains younger than 25 years old. Our 4th of July event raised about $200-300 from tamale sales. The puppet show was super popular. Oct. 1 – Pedal for Polio needs housing for riders. Gary recognized Donna with her Past President pin, thanking her for her service. Gary recognized Roger for earning his Paul Harris Fellow x3! Congrats, and thank you, Roger! Today’s Raffle Winner: Matt Drewno — congrats!